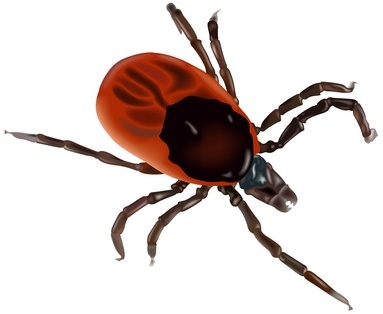 Summer is officially here and it brings with it many exciting activities – delicious backyard BBQs, swimming at your local pool, camping under the stars, and family vacation road trips – but one thing that summertime also brings (which isn’t very fun) is fleas and ticks. Fleas and ticks carry a multitude of diseases that can be transmitted to both pets and human – Lyme Disease, Tapeworms, and Cat Scratch Fever, just to name a few. Needless to say, these nasty pests can cause much discomfort in both humans and their pets. 1. The very first thing you must make sure of is that your pet is being fed a balanced, high quality raw food diet, like BARF World’s Juicy BARF Diet patties and nuggets. A bones and raw food diet (BARF) is what your pet is naturally designed to eat. Feeding your dog BARF relieves stress on the digestive system and results in maximum absorption of nutrients to support a healthy immune system. 2. Supplement your dog’s diet with E-BARF Plus – an added digestive aid and overall health support supplement from BARF World. E-BARF Plus helps give your pet’s immune system an added boost during the flea/tick and allergy season. Plus it contains Brewer’s Yeast and Garlic Powder – two ingredients fleas and ticks absolutely detest! 3. Be sure to include omegas 3, 6, and 9 (like those found in BARF World’s E-Omega Coat oil) in your pet’s daily meals to strengthen skin, coat and heart health. It is quite rare to find a BARF fed dog with a serious flea and tick problem. Fleas and ticks seem to prefer unhealthy animals as they are less able to fight an infestation. Healthy puppies raised on natural raw food (like the BARF diet), do not exhibit the range and severity of skin issues that their artificially-fed cousins suffer from. Mix one drop each of Lemon, Lemongrass and R. C.* per ounce of water. Spray this on your dog after they are dried off. You can also spray them with this any time they are going into an area that is flea/tick or mosquito infested to help repel them. I do not recommend spraying essential oils on cats because of their sensitivity to strong odors, such as essentials. * R.C. is a blend of essential oils containing four blends of Eucalyptus species, Pine, Lavender, Cypress, Spruce, Myrtle, Marjoram and Peppermint. For the yard: Put 2 ounces of dish soap in an Ortho hose sprayer bottle and fill the rest up with water. Spray the entire yard once or twice per week to kill adult fleas. Repeat as needed or weekly for prevention during flea season. Do not spray succulent plants – if you do, rinse plants off after spraying. To kill flea eggs, mix 1/4 tsp Wintergreen per ounce of water in your hose sprayer and spray after the soap mixture. Do this once per week until there are no fleas on your pets and then repeat as needed. Mix one drop of each of the following oils in water and spray it on them each day they go out in tick-infested areas: Lavender, Lemongrass, Sage and Thyme. I recommend using it in their bedding areas and places they sleep or hang out. If you follow these natural care tips, I’m sure you and your pets will stay flea and tick free this summer!